President Donald Trump speaks during a news conference with Swedish Prime Minister Stefan Lofven in the East Room of the White House, March 6, 2018. President Donald Trump said the United States is "willing to go either way" in response to North Korea's development of nuclear-tipped missiles, adding "hopefully it's going to be the proper way." The president's comments came after South Korea said Tuesday the North is willing to start talks with the United States about giving up its nuclear weapons. Trump's latest remarks on North Korea stand in stark contrast to his previous threat to respond with "fire and fury" to Pyongyang's development of weapons of mass destruction. "We cannot let that situation fester," Trump told reporters in the Oval Office where he was hosting Swedish Prime Minister Stefan Lofven. 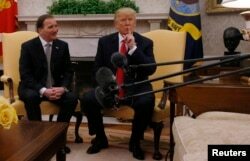 U.S. President Donald Trump meets with Sweden's Prime Minister Stefan Lofven, left, in the Oval Office at the White House in Washington, March 6, 2018. "It would be a great thing for the world" if the current dialogue between Seoul and Pyongyang defuses tensions on the Korean peninsula, Trump said. He also cautioned that the inter-Korean talks "may carry over, it may not," while noting that "it's a very tenuous situation." A senior U.S. official said the Trump administration is open-minded but skeptical about Pyongyang's intentions, noting North Korea has a 27-year track record of breaking "every agreement that they've ever made with the United States and the international community." The official, speaking on condition of anonymity, added "it's good for everybody to keep some perspective and take a deep breath." ​North Korean leader Kim Jong Un "shows no interest in walking away from his nuclear or ballistic missile programs," Lt. Gen. Robert Ashley, director of the Defense Intelligence Agency, told the Senate Armed Services Committee on Tuesday. "Additional missile launches are a near certainty, and further nuclear tests are possible." Trump on Tuesday again blamed previous U.S. administrations of both parties for allowing North Korea to develop weapons of mass destruction. "These are the cards we were dealt. We're handling it properly," the president said. Asked if he would be willing to meet Kim Jong Un, Trump replied, "We'll see what happens." At a subsequent joint news conference with Prime Minister Lofven, Trump said a possible breakthrough on the Korean peninsula results from U.S. and U.N. sanctions that "have been very, very strong and biting." He also said "China has been a big help. I think that's been a factor," but Beijing could do more to pressure Pyongyang. 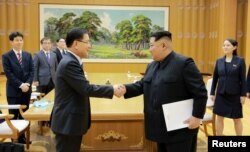 North Korean leader Kim Jong Un greets Chung Eui-yong, head of the presidential National Security Office, in Pyongyang, North Korea, March 6, 2018. South Korea's top security adviser, Chung Eui-yong, told reporters Tuesday that Pyongyang signaled there was no need to keep its nuclear program if military threats against the country are eliminated. Chung added North Korea was receptive to discussing denuclearization and normalizing relations with the U.S.
Chung was part of a South Korean delegation that just returned from a two-day visit to North Korea, where the group held an unprecedented meeting with North Korean leader Kim Jong Un. Representatives of South Korean President Moon Jae-in are to visit Washington this week to brief U.S. officials about the inter-Korean talks. "We don't have a play-by-play of that just yet. We will wait for the Republic of Korea to come to Washington and to be able to brief us on these meetings," State Department spokesperson Heather Nauert told reporters Tuesday. U.S. Senator Ben Cardin told VOA on Tuesday that Seoul's announcement is a "positive sign" and urged the Trump administration to "take advantage of this opening." The Democrat from the state of Maryland added that the "only sensible way to end this crisis is through diplomacy. It starts with North Korea freezing its current [nuclear] program." 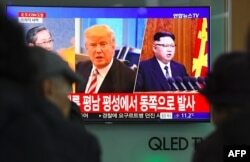 FILE - People watch a television news screen showing images of U.S. President Donald Trump and North Korean leader Kim Jong Un, at a railway station in Seoul, South Korea, Nov. 29, 2017. North Korea has repeatedly demanded, as a condition for dialogue, that the United States and South Korea stop conducting joint military drills, which it contends are a prelude to an invasion. Those annual war games, however, are to resume next month. "It's only natural that our routine defensive exercises will resume," according to a senior U.S. administration official. In the last two years, North Korea has launched numerous medium- and long-range ballistic missiles and conducted two nuclear tests, in large part to develop an operational capability to target U.S. mainland cities with a nuclear-armed intercontinental ballistic missile. The Trump administration has led international efforts to pressure Pyongyang to halt its nuclear program by imposing tough sanctions that ban billions of dollars' worth of North Korean coal, iron ore, clothing products and seafood exports. The Trump administration has also said that, if necessary, it is prepared to use military force as well to eliminate the nuclear threat. VOA's Jeff Seldin from the Pentagon and Michael Bowman from Capitol Hill contributed to this report.